You are here: Home / Electric Bike News / The New OHM XU450 Electric Bike: Gates Carbon Drive, SRAM E-Matic, Hydroformed Aluminium Frame, & More! The bike features the new SRAM E-Matic automatic shifting system and the clean and low-maintenance Gates Carbon Drive, as well as a step-through frame for easy mounting and dismounting. Aimed at the North American market, the XU450 E2 is designed for simplicity and convenience to attract consumers who are new to e-bikes and want a car-replacing alternative for commuting and errands. The SRAM E-Matic automatically shifts to add the right level of pedaling assistance, removing the need for shifters and an LCD screen on the handle bar. Riders simply turn on the battery and start pedaling. The XU450 E2 also does away with a greasy chain in favor of a clean and quiet Gates Carbon Drive belt and sprockets. The XU450 E2 is ideal for rental and resort markets thanks to its full step-through design that makes jumping on and off easy. The Advance™ series hydroformed frame makes the bike lighter, stronger and more rigid for better handling. It will be available in four sizes to fit a broad range of riders. As the leading electric bike manufacturer in Canada, OHM Cycles hopes to tap into the growing North American and worldwide markets for e-bikes. Electric bikes are already being used widely for urban commuting, and have commercial applications for police, security, resorts, rentals, and delivery services. Electric bike sales now account for two out of every ten bikes sold in Europe, and the trend is catching on in North America. Customers can start ordering in Spring 2013 through OHM Factory Stores or OHM Authorized Dealers. OHM will debut more new models with Carbon Drive in September, timed for coverage at Eurobike and Interbike. 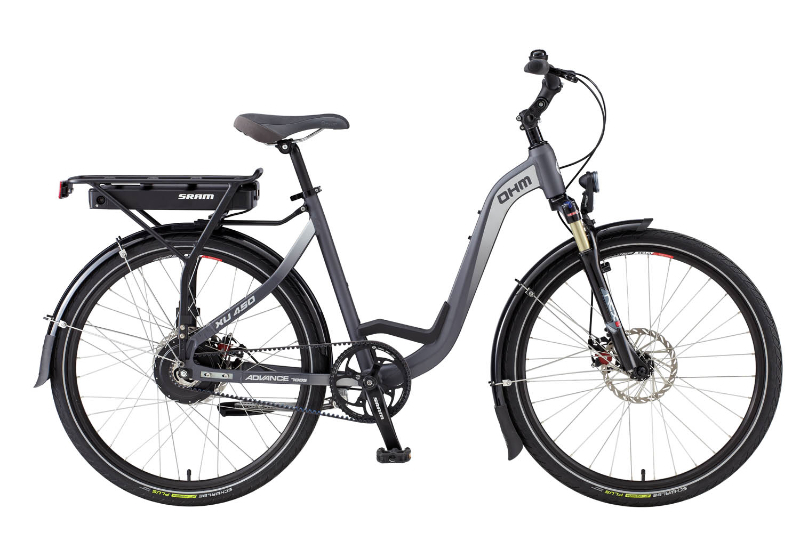 Journalists attending the Taipei International Cycle Show can view the OHM Urban XU450 E2 in the Gates Carbon Drive booth: N0623 in the Nangang Hall. Built for urban commuters and price-conscious customers who want the benefit of pedal assistance with the simplicity of automatic shifting and low maintenance of a belt drive. 36V Li-ion battery available in three sizes. Available in multiple frame sizes to accommodate a wide range of rider heights. ADVANCE™ hydroforming produces a strong, light and rigid frame, with a standard wheelbase for best maneuverability and handling. SRAM Elixir 3 hydraulic disc brakes for precise control and stopping power. SRAM E-Matic battery integrated with rear carrying rack is available in different power capacities depending on the customer’s needs for range and power. Gates Carbon Drive CenterTrack system. Schwalbe ENERGIZER Plus tires with GreenGuard puncture protection, low rolling friction and excellent grip. Consisting of two lightweight metal sprockets and a high-strength belt embedded with carbon fiber cords, Gates Carbon Drive™ is a low-maintenance, chain-replacing technology from Gates Corp., the global leader in automotive and industrial belts. Clean, quiet, light and strong, Carbon Drive requires no greasy lube, weighs less than a chain drive and will not stretch. Carbon Drive is the leading belt drive system for e-bikes, with models from Smart, Grace, OHM, Bergamont, Mi-Tech, MTB Cycletech and more. Due to its low maintenance and ease of use, Carbon Drive is a technology that can get more people on bikes. Visit https://www.gatescarbondrive.com. SRAM® is a global manufacturer of high-end bicycle components. They were founded in Chicago, Illinois in September of 1987 with the invention of Grip Shift® – a revolutionary twist shifter that enabled shifting gears with the twist of the wrist. Over the years following, Grip Shift became the favorite shifter amongst top mountain bike professionals. Through the early years and continuing through today, SRAM has focused on building its organic product development capability, but also has completed strategic acquisitions focused on amplifying this capability. In 1997 SRAM acquired Sachs Bicycle Components, in Schweinfurt, Germany and expanded its global reach throughout Europe. In 2002, they acquired RockShox®, adding suspension components to its ever-growing product offerings. In 2004 both Avid® and Truvativ® were acquired, adding disc brake technology and crankset proficiency to its line. In the fall of 2007, Zipp® was added to the mix bringing high-end carbon fiber wheelsets and accessories into the family. Early in 2011, the Power Measurement brand Quarq® joined the team. Today, SRAM is the 2nd largest manufacturer of bicycle components in the world. With 2500+ employees, and offices and manufacturing in 15 countries, SRAM is truly a world-class leader in performance bike parts. For more information about SRAM, its products, and its brands – visit https://www.sram.com. Nothing about the motor, such as wattage. And nothing about the capacity of the battery. Not the way to court the savvy. I am working on getting more specs on this bike. I may be doing a full review soon. Hi MJ, Motor is SRAM 250W E-Matic (Max torque 55Nm) with 2 speed automatic shifting. Battery is available in three sizes: 36V 6Ah, 8Ah and 10Ah with range of 20-60 miles. Please contact us for further info! Fantastic – Wonderful – Finally. A belt drive electric bike with transmission and disk brakes. I signed up with the nearist OHM dealer for delivery news. Derailleurs have been obsolete for decades – probably from the first time they were put on a bike. Does anyone know the actual weight of the bike?